Franklin Graham: "the majority of Christians in this country just did not vote for whatever reason"
Read more about Franklin Graham: "the majority of Christians in this country just did not vote for whatever reason"
"I responded to a question. I'm not going out making speeches about where the President was born." 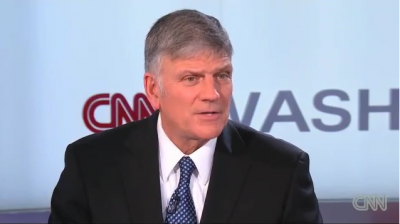 Franklin Graham responds to heat over statements about Obama in ABC interview. Read more about "I responded to a question. I'm not going out making speeches about where the President was born."